A team led by University of Kansas Distinguished Professor Rolfe Mandel in July excavated a northeast Kansas site in Pottawatomie County seeking to find artifacts tied to the Clovis and Pre-Clovis peoples, the founding populations of the Americas. The team is awaiting the results of dating of sediment samples tied to recovered artifacts, and if the sediments are confirmed to be more than 13,500 years old it would open the door to a discovery of the earliest evidence of people inhabiting this part of the state and the Central Great Plains. The 20 days of excavating a bank on the north end of Tuttle Creek and the Big Blue River — known as the Coffey Site —this summer was part of KU’s ODYSSEY Project, which Mandel directs, and it gives KU undergraduate and graduate students archeological field experience. ODYSSEY team members have made the only other discovery of Clovis period people inhabiting Kansas or Nebraska when they discovered a stratified Clovis-age site at Kanorado, which is near Goodland in northwest Kansas on the Colorado border. Mandel was hopeful the recent dig at Tuttle Creek would yield evidence that Clovis people inhabited the site in northeast Kansas at least 13,500 years ago, but he said based on the depth of the artifacts in the bank, it’s possible their findings could be associated with the earlier Pre-Clovis people. “There’s no question that there’s something there. It’s a matter of getting a handle on the age of it,” Mandel said. 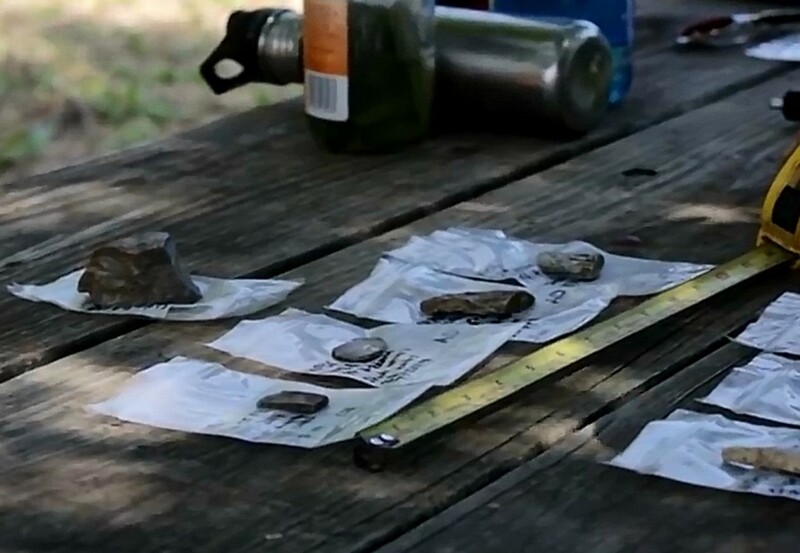 Items recovered in July included portions of two projectile points — that were likely tied to spear points — and a hafted drill. Although the spear points and drill found this summer are considerably younger than Clovis, a spear point and another artifact found at the Coffey site last summer represent the immediate successors of Clovis. Mandel said that below these items are artifacts that may be the material remains of Clovis or Pre-Clovis people. A key test in attempting to date the artifacts is determining when the sediments containing them were last exposed to light before being buried. Another key in trying to verify the age of artifacts is whether they are found to be resting in horizontal or vertical positions. Mandel said artifacts in vertical positions are less likely to be associated with the age of the sediments containing them because it’s possible the items could have fallen down a crack in the sediments, for example. As they analyze the materials, including the tools recovered from the bank to try to tie them to Clovis or Pre-Clovis people, Mandel said the Paleoindian population was known to bring items from long distances, so it may help scholars map population movement in early America and the Central Great Plains. In addition to hunting megafauna, that included mammoth, large extinct forms of bison, and American camel, the inhabitants in the area likely also gathered a variety of plant foods. As the analysis of the artifacts from July’s dig continues, Mandel — who has spent a large part of his career looking for clues to verify the earliest inhabitants of the region — waits to find out how significant of a discovery the ODYSSEY Project participants made during their hot, long hours digging and excavating on the river bank in northeast Kansas.